The dirt on the windows is agitated by using a soft bristle brush in combination with a telescopic pole & 100% ultra pure di-ionised water. This is a very effective method for cleaning windows and in most cases gives much better results and is far safer than cleaning windows by using the more common traditional methods. The aggressive strength of 100% ultra pure de-ionised water is very effective indeed, meaning that we don’t need to use cleaning detergents on the windows during regular cleaning, so your windows will generally stay cleaner for much longer, plus it’s better for the environment. Pure water in fact does not like being pure at all and will attempt to return to its original state; therefore it actually absorbs dirt particles from the glass aiding the cleaning process behaving almost like a solvent. The ultra pure water we use for your window cleaning is produced in a system in the back if our van using a 6 stage reverse osmosis. Water in the Hereford/Worcester area is generally very hard indeed and readings we get before any water is passed through the first stage of our reverse osmosis system varies between 200-250 ppm (parts per million). After we pass this water through our reverse osmosis , the readings drop to 0 ppm which is absolutely perfect for window cleaning. 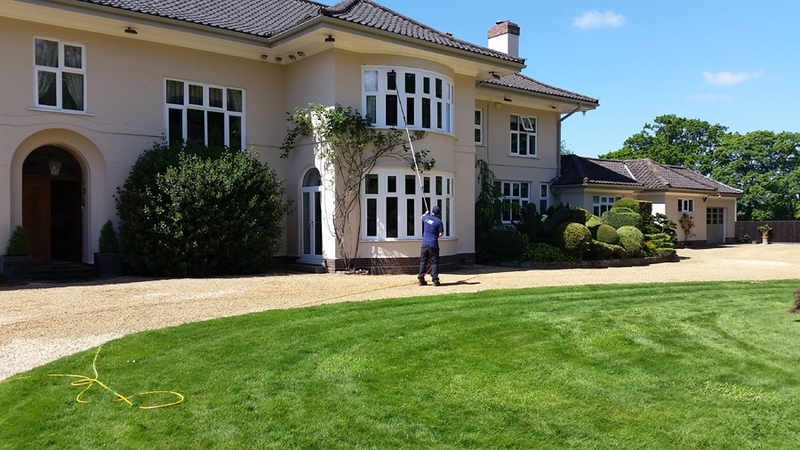 We can clean some of the most difficult to reach windows safely and effectively from ground level including windows above: Car Ports, Garages, Conservatories, Extensions, Fences, Porches, Sloped Roofs, Flower Beds, Shrubs and Hedges using the ‘Reach & Wash’ system. We offer 6 week and 12 week cleans.. Plus 24 hr guarantee with each and every clean.